Sharing features among our portfolio companies (ventures) is one of the major economic benefits of Yves & Zed. However, its practical realization can sometimes be tricky, and we had to find clever ways to handle packages, their dependencies, and versioning. We share simple features including catalogs, CMS, discounts, and we also share advanced features including order processing and data warehousing. Whenever we feel a feature could contribute to our portfolio, and is required by at least two ventures, we consider to implement it in the core. As you can imagine, a decision like this must be taken with care, and on a solid experiential basis with a clear vision of future projects in mind. However, the major challenge lies in the efficient, trouble-free management of shared code. So we think it’s worth taking a look at how we do it. Experience has shown that it’s useless to force a complete systems update for startups against their will. This is because they often request updates for certain features instead of the whole system. The latter is expensive, inefficient and leaves little room for their individual development. To avoid that, they tend to skip some releases and sooner or later end up with unstable systems. That is why we have split Yves & Zed into functional units called packages, e.g. “auth-package“,“catalog-package“ or “dwh-package”. Each has a version number, e.g. ‘3.2.6’ which is updated after every major, minor or patch-release. Example: If a venture wants to update the catalog-package to version 3.1.2, they also must update the infrastructure-package to version 1.0.0. To sum up: Yves & Zed consists of a number of versioned, often interdependent packages (functional units), some of them optional, some of them mandatory to get the system up and running. Besides keeping the amount of dependencies as low possible, we strive to make sure our staff and our ventures can keep track of existing dependencies. For this purpose, we have taken quite a few measures. Package-separation. 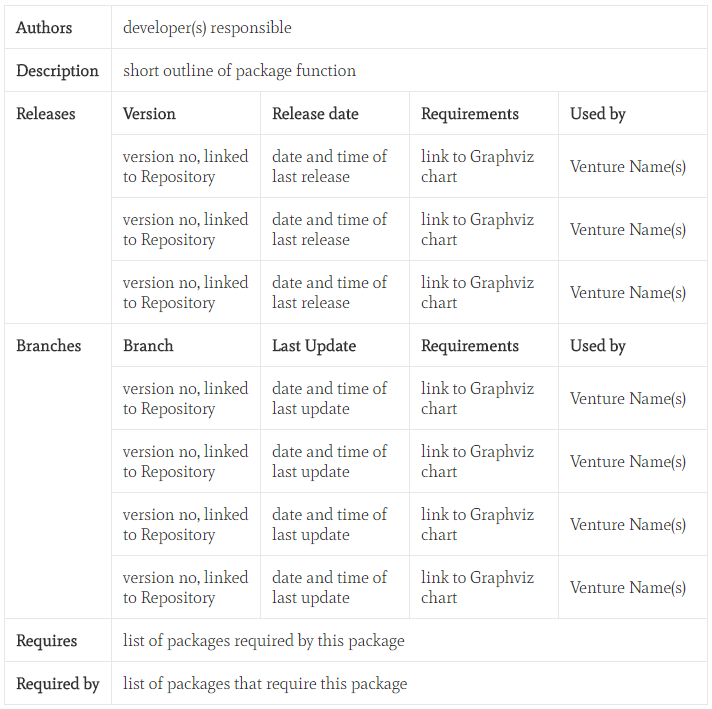 Each package has an own Git-repository (generated with Satis) and is equipped with its own user manual. Whenever we update a package, we adapt the corresponding manual chapter and prepare a changelog-email, which is then distributed to our IT department and our ventures. Our dependency graphs are created on the basis of static code analysis which we use to detect dependencies.